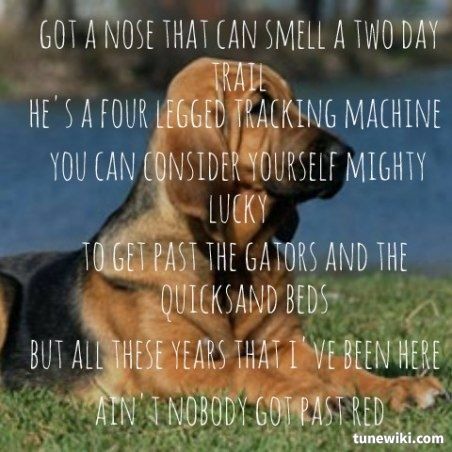 For today's Dog Song Saturday at Talking Dogs, we've got a country tune with quite a story. Ol' Red was written by James "Bo" Bohan, Don Goodman and Mark Sherrill and originally recorded by country legend George Jones in 1990. In 2002 Blake Shelton released his cover on his self-titled debut album and it became a top 20 hit. In the song a prison inmate is serving a 99 year sentence for murder. He has the job of taking care of Ol' Red, a Bloodhound used by the prison guards to track escaping inmates. The dog as foiled every escape attempt so far and the warden even goes so far as to dare the inmates to try to escape because "Ol' Red is itching to have some fun. Listen to the lyrics and see if Ol' Red keeps up his reputation! I have always loved this song and video by Blake Shelton - I especially love the ending of the video! I don't think I ever realized it was a cover song though!